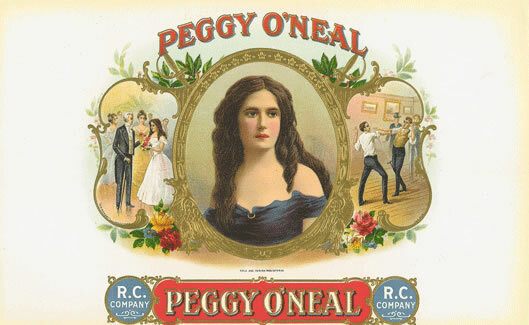 Peggy O'Neal was also known as Margaret Eaton born in Washington DC on December 3 1799. She was married to John H. Eaton, a Tennessee senator and Secretary of War in the Andrew Jackson Administration. Peggy was renowned for being overtly flirtatious and sexual at a time when "respectable" women, as a group, were not and it was alleged that Timberlake, her first husban, had been driven to suicide because of her affair with John Henry Eaton. She was snubbed by Mrs. John Calhoun and other cabinet members wives. President Jackson sided with the Eaton's and this led to a split within his party's leadership as was know as the Petticoat Affair. Finally Eaton resigned his post along with several other cabinet members. After the death of her husband she married a young Italian dancing-master, named Antonio Buchignani in 1859. She was 59 and he was in his twenties. In 1866, Buchignani ran off with the bulk of her money and her granddaughter. She obtained a divorce from him and died in poverty in Washington D.C. on November 8, 1879.